The Oxford Handbook of Hypnosis is a successor to the three editions of Contemporary Hypnosis Research which were published between 1979 and 1992. It is a comprehensive exploration of hypnosis split into four sections, with contributions from authorities in the field. Section one examines the territory of hypnosis. Section two covers theoretical perspectives including dissociation, sociocognitive, cognitive, and psychoanalytic theories. Section three reviews research and explores the concept and measurement of hypnotisability, research design, and analysis of neuroimaging findings. Section four is devoted to clinical issues and psychodynamic, cognitive, and Ericksonian approaches receive separate coverage. Then techniques and case studies are presented for a range of clinical conditions including pain, anxiety, depression, and conversion disorders. One key development since publication of the last edition of Contemporary Hypnosis Research is the explosion of research focussing on the brain. The 1990’s were the ‘Decade of the brain’ and the field of cognitive neuroscience advanced rapidly in step with the development of new neuroimaging tools. Technologies such as positron emission tomography (PET) and functional magnetic resonance imaging (fMRI) allow scientists to non-invasively examine the workings of the living brain and have furthered our understanding of how humans perceive, understand, think, and feel. The Oxford Handbook of Hypnosis reflects this development in neuroscience with three chapters which focus on how hypnosis affects brain function. Barabasz and Barabasz provide an introduction to brain imaging techniques, then go on to review research presented at the Tennessee Conference on Brain Imaging and Hypnosis, with a particular emphasis on EEG/ERP findings. David Spiegel reviews a range of neurobiological evidence on hypnosis, including a particularly interesting section on ‘default mode processing’ which could easily be integrated into all hypnotic functional imaging studies. Finally, David Oakley makes a distinction, as do others in the volume, between instrumental research which focuses on what hypnosis can do, and intrinsic research which focuses on what hypnosis is. His chapter contains important commentary on the implications of how our definitions of hypnosis impact our research designs and the interpretability of neuroimaging data. In the clinical section Joseph Barber writes a thoughtful chapter on the integration of hypnosis into cognitive therapy. 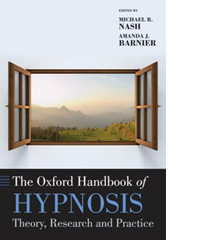 Baker and Nash cover hypnosis in psychodynamic therapy, with consideration of its use in symptom amelioration, insight oriented therapy, and in long-term therapy. Stephen Lankton provides a clear description of Ericksonian hypnotherapy, with particularly illustrative case examples. The clinical chapters covering individual conditions are too numerous to review separately but Jensen & Patterson’s chapter on pain is comprehensive. The often thin evidence base for the clinical use of hypnosis (excepting pain research) is reviewed in a chapter by Moore and Tasso. They find that hypnosis can be considered a possibly efficacious treatment for pain, that for smoking the evidence is mixed, and that for irritable bowel syndrome the evidence is ‘promising’. Moore & Tasso neatly summarise the research difficulties inherent to the adjunctive use of hypnosis and are rightly disappointed by the lack of evidence for the use of hypnosis in psychotherapy. If I have a gripe with The Oxford Handbook of Hypnosis it is that the introductory chapter by Barnier & Nash seeks to close down debate about the nature and definition of hypnosis. They dismiss a sociocognitive to stance defining hypnosis as “a context question of modest interest” and one which “drain[s] the field of its relevance”. Fortunately a number of the research chapters, and not just those by the usual suspects, profitably draw a distinction between trance and suggestion and demonstrate that the matter has important implications for intrinsic research in hypnosis. An epic scholarly work, The Oxford Handbook of Hypnosis really is the benchmark reference volume for those interested in hypnosis. If you are serious about understanding the contemporary study and practice of hypnosis then this book is a must. Dr Alladin is a clinical psychologist and Adjunct Assistant Professor at Foothills Medical Centre and Department of Psychiatry and Psychology at the University of Calgary Medical School. His book is a generally excellent exposition of the use of hypnosis in medicine and psychiatry/psychology. It gives the reader theoretical background regarding the nature of hypnosis, outlines broad treatment strategies, and reviews the use of hypnosis with a series of medical and psychological problems. Finally, Dr Alladin outlines his own hypnotherapeutic treatment program for depression which combines cognitive-behavioural therapy (CBT) with hypnosis. The section on theories of hypnosis which focuses on Hilgard's neodissociation theory is slightly disappointing given Dr Alladin's obvious knowledge of different strands of hypnosis theory. Dr Alladin also perpetuates a few myths regarding the right hemisphere ("hypnosis, imagery and affect are all predominantly mediated by the same right cerebral hemisphere"). Nevertheless, the focus of the theory chapter is understandable in the context of describing hypnosis to professionals, whose key goal will be clearly explaining hypnosis to their clients. Dr Alladin provides clear practical instructions and information regarding all stages of practical hypnotherapy, including preparing the patient for hypnosis, induction and deepening (a number of scripts are included), therapeutic suggestions, ego-strengthening, post-hypnotic suggestion, and self-hypnosis. He reinforces the idea that hypnosis is not therapy and that it is best used as an adjunctive tool alongside other therapeutic stragegies, while giving clear advice on how to integrate hypnosis into treatment. More background information and detailed treatment strategies are outlined for a number of conditions including respiratory disorders, gastrointestinal disorders, anxiety disorders, conversion disorders and insomnia, and these are often accompanied by useful scripts to guide the clinican. Greater attention is paid to the treatment of migrane and to the author's programme for the cognitive-behavioural-hypnotherapeutic (CBHT) treatment of depression. This well-developed 16-session treatment program is clearly described and has recently received some empirical support, with CBHT outperforming CBT in a randomized trial (Alladin & Alibhai, 2007). The final chapter usefully contains comprehensive and up-to-date information about professional hypnosis organizations and opportunities for training worldwide. This is a fascinating book and suitable for any clinicians interested in using hypnosis.